OK, so you’re wondering what’s the news here? We know people like video online. Well, the marketing and research firm, Horowitz & Associates, put out a news release this week that says 6 out of every 10 high-speed Internet subscribers watch or download video at least once a week. 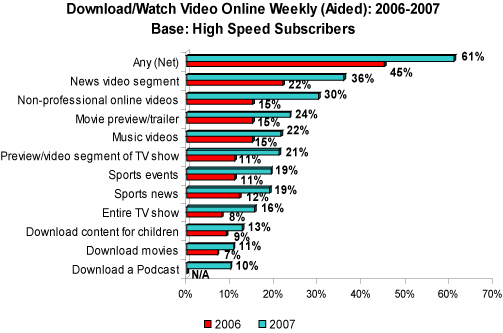 More than one third of them watches or dowloads news video at least once a week. What’s different is how much these views and dowloads have increased from 2006. Over one quarter (27%) of Internet users have a cell, iPod/MP3 player, or PDA with video capability, and an additional 23% do not have this capability but are interested in getting it. Among those with video-enabled handheld devices, one-third (35%) watch video on their devices at least weekly and 62% do so at least monthly, translating to eighteen percent (18%) of Internet users overall who watch video content on a handheld device at least monthly. This figure is up from 8% just one year ago. When we’re thinking video, it’s clear we have to think TV, Web and beyond.